Local residents now have a new way to engage even further with Sefton Council and its partners. Constituency Forums are being introduced as a more relaxed way for residents to talk to agencies, councillors and Council departments about any issues they have. The forums will be held twice a year in each of the respective Parliamentary Constituencies within Sefton; Bootle, Central Sefton and Southport. Cllr Paulette Lappin, Cabinet Member Regulatory, Compliance and Corporate Services, said: “After consulting about the old and aged style of Area Committees, we decided to take a look at how we engage with our communities and came up with the idea of the Constituency Forums. “The format of the Constituency Forum will be a market-place style at which there will be a number of tables for ward Councillors, internal Sefton departments and partners to attend. “This will give our valued residents the opportunity to arrive, get a drink and talk to agencies, councillors and departments about any issues they have, moving from table to table depending on the resident’s particular needs. “We hope that this new format will remove the formality of the old Area Committee process and attract residents to a more relaxed public meeting at which they feel that the Council and its partners are more accessible and friendly. Sefton residents are being made aware that the South Sefton Recycling Centre, Irlam Road, Bootle will be temporarily closed from Monday June 18 – Friday June 22. This is to allow essential maintenance work to take place. During the closure residents can still recycle their household waste by using any of the fourteen other recycling centres across Merseyside. The closest to the Irlam Road are Cheadle Avenue, Old Swan or Sefton Lane, Maghull. South Sefton recycling centre will reopen on Saturday June 23. Residents are also reminded not to leave any waste or dump rubbish outside any recycling centre. This is flytipping and if caught, offenders can face considerable fines. Carl Beer, Chief Executive of Merseyside Waste & Recycling Authority, said: “Working with our contractor Veolia the bulk of the maintenance work will introduce new traffic management measures including height restriction barriers and lane guards, which will be used to divert vehicles suspected of carrying non-household waste into areas where they can be safely and efficiently inspected. “South Sefton has an issue with commercial operators and traders using vans to bring non-household waste onto site for disposal. The current layout means any vehicles stopped can create queues and tailbacks, which isn’t the most efficient use of the site. The new measures should put an end to this. “We’re also taking the opportunity for some essential refurbishment work around the Centre including: repair and replacing containers, repairing lighting complete clean of the Centre, replacement of kerbstones, repair and replacement of signage and improvements to road marking and ‘safe’ routes around the site. A record 36,000 visitors enjoying all of the delights of the 12th Annual Southport Food & Drink festival last weekend. Food such as Persian lamb dishes, award winning oriental food, wild boar burgers, vegan food, waffles and chicken to name a few, were on offer from over 80 street traders. Local producers were joined by businesses from over the North West and sold food such as cheese, pies, scones, brownies and fudge with many selling out each day and leaving with smiles on their faces. As a family event the little ones enjoyed the children’s entertainment where there were regular magic shows, grass sports, face painting, slime making and crafts. Inflatables and water walking also provided plenty of entertainment. Families and groups of friends attended the event and thoroughly enjoyed their visit with many setting up a picnic area on the grass and enjoying the entire day and beautiful surroundings of Victoria Park. Cllr Marion Atkinson, Sefton Council’s Labour Cabinet Member for Regeneration and Skills, said: “Record numbers of both visitors and traders enjoyed this year’s Southport Food and Drink Festival, which continues to be bigger and better each year. “We had really good weather this, combined with an array of delicious food and mouthwatering drinks, led to a fantastic three days at Victoria Park. “This is just the start of an exciting events programme organised by Sefton Council, with the Air Show taking place in July followed by the British Musical Fireworks Championship at the end of September – there really is going to be something for everyone. Sefton welcomes over 8.7 million visitors a year contributing over £518 million to the local economy. Sefton Council has successfully engaged Bliss, a leading Hotel and Leisure company, to revitalise the Southport Theatre and Convention Centre (STCC) as part of a major investment in the town. Bliss is already well established in Southport, owning and operating the Waterfront complex, which includes the Ramada Hotel, winner of the Hotel of the Year 2017. The Council owned STCC, which adjoins the Bliss complex, is a crucial part of Sefton’s visitor economy as the primary conference venue. It is also the biggest theatre in the borough with a seated capacity of over 1,600. The new plans for the STCC put it at the heart of the Bliss strategy to develop the Waterfront as one of the best and most vibrant coastal destinations in the UK attracting new investment, new visitors and providing a significant boost to the local economy. This will include new facades and landscaping to create improved flow and visibility around the Waterfront and encourage 360’ usage of the complex and promenades. Cllr Ian Moncur, Sefton Council’s Cabinet Member for Health and Wellbeing, said: “We are totally committed to ensuring that the STCC has an ambitious future and are delighted that Bliss are confirmed as the new operator. “Bliss are as ambitious as the Council for the waterfront area and we look forward to seeing great improvements in the overall quality of productions and increased conference numbers at the important STCC as well as wider enhancement to the whole waterfront. Robert Agsteribbe, Co-founder of Bliss Hotels and Bliss Investment Partners, said: “Together with Sefton Council, we will create a lively, world renowned Waterfront by stimulating growth and economic activity with everyone enjoying the next generation of elevated theatre entertainment with amazing new performance experiences. Avoid driving penalty heartache this World Cup campaign! 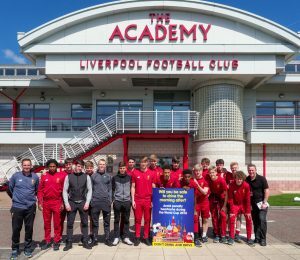 As the World Cup approaches, Liverpool Football Club’s Academy has teamed up with the Merseyside Road Safety Partnership to highlight the dangers of driving the morning after drinking alcohol. The campaign was launched with players from the Reds U18 side who took part in an interactive session aimed at highlighting the effect that alcohol can have on people’s reactions. Many people will enjoy a few drinks as they watch the football and most wouldn’t even consider getting into their car and driving afterwards. However, there is a real risk that people who would never deliberately drink and drive may still be over the limit, or unfit to drive, the ‘morning after’. This is because it takes a lot longer than most people think for alcohol to pass through the body. On average it takes around one hour per unit of alcohol, though this can vary depending on a number of factors. Merseyside Road Safety Partnership features local authority members, including Sefton Council, as well as additional partners including Merseyside Police, Merseyside Fire and Rescue Service, Merseytravel and Highways England. Station Manager Steve Pang, Spokesperson for Merseyside Road Safety Partnership, said: “The decision to get behind the wheel of a vehicle the morning after drinking can have very serious consequences, not only for the driver but also potentially for other road users around them. Paul Mountford, Merseyside Police Lead for drink and drug driving, said: “Merseyside Police will be conducting numerous roadside operations and breath and drug testing hundreds of drivers across Merseyside throughout this campaign to ensure that drivers understand the principles of this campaign – that the only safe drink drive limit is zero. “Many drivers are unaware that even a small amount of alcohol may affect their driving ability, placing themselves at an increased risk of a crash and arrest. They may be arrested for ‘drink driving’ even if they pass a breathalyser if the officer considers them to be unfit. This is particularly relevant the following day when many will not consider their driving fitness after a night’s sleep. Phil Roscoe, Head of Education and Welfare from Liverpool FC said: “The session with the Road Safety team was really interesting and helped to raise awareness of the effects that alcohol can have on your body, even the morning after having a drink. The main message from the campaign is not ‘don’t drink’, but ‘don’t drink anything if you are driving’ and ‘don’t drink heavily if you have to drive the following morning’.